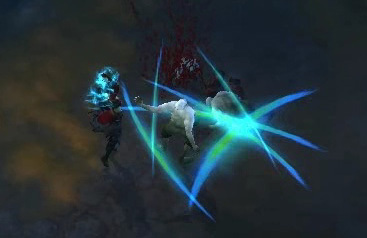 A lot of work went in to Flux’s guides of skills, like the Full Wizard Skill Trees, and they have been an invaluable source for the Diablo Wiki entries of all the new Skills. 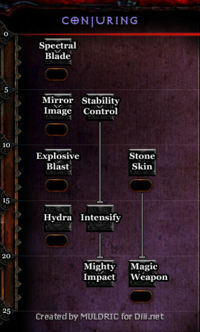 Muldric has also been a great help in visualizing the skill trees for all of us, and now it’s time to add the “lost” Wizard skill trees to the rest. Spectral Blade – Summons a spectral blade that strikes each enemy in front of the Wizard 3 times causing physical damage with each hit. Mirror Image – Creates an illusionary duplicate of yourself that lasts for 8 seconds that has 20-100% of your health. Stability Control – Health Globes also restore some mana when picked up. Explosive Blast – A blast of energy explodes at the target causing arcane damage in a small radius. Stone Skin – Shield yourself with rock and stone, absorbing damage during an 8 second period. Hydra – Creates a hydra that attacks your enemies with bolts of fire. Hydra deals 6-10 damage per attack. Intensify – When you pick up a health globe, your critical hit chance increases for 7 seconds. Mighty Impact – Increases critical hit damage by 10%. Magic Weapon – Imbue your weapon with magical energy granting it increased damage. From 25-35 damage and up, for 2 minutes. Also, don’t forget to check out the latest wiki updates on the top of the Diablo 3 news page, as this is just one of many updates in the last few weeks. Among the updates you might want to check out the Wizard skill archive, that we started with the creation of new ones and the archiving of the outdated articles. Thanks Holyknight3000, Midoxp, DxAxxxTyriel, Veskin7 Bukito, Vipermagi, TheWanderer, Flux, Fronkenstein, Fighterbitsj, Dragonhelmuk, Krunkest404 and Bran Maniac for the last 2000 edits in the last 2 weeks!